In most modern engines, a serpentine belt runs all the accessories. Image from Flickr. In most engines, there are anywhere from one to four belts that run some of the most basic parts of your engine. The belts are easy to forget about — they don’t require attention as often as oil changes — but they are incredibly important. What is the best way to care for and change the belts in your vehicle? Most belts in vehicles are made from rubber or a combination of rubber and plastic. This combination of materials has a tendency to wear out, crack and decay. The tension the belts are under combined with the hot-and-cold conditions they usually run under means that they will stretch and break. 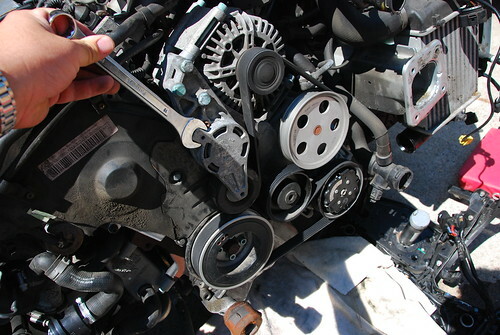 Belts usually run the cooling system, alternator, and accessories in a vehicle. In some cars, there are three or four separate belts that run each part. In most modern vehicles, there is one long serpentine belt that runs everything. When a belt starts to squeal or screech, it means that it is stretching out. Every time you check your oil or take your car to the mechanic, you should have your belts checked. If you see a belt that is cracking or splitting, it is time to replace them all. With some experience, replacing a belt is relatively easy. First, copy down the diagram of how the belt runs around the engine. Loosen the tension of the belt and remove it. Put the new belt in the engine and re-tighten the tensioners. There is a theory that “dressing” a belt — lubricating it with a specialty spray or liquid — can help it last longer. This is only partially true. Dressing a belt can make it stop squeaking or squealing for a short amount of time. Remember, though, that a belt making noise is a warning that something is going wrong. You should only dress a belt for temporary silence while you get your car to the mechanic.